So, sometimes when you really love sewing people around you love to share their sewing experiences which is one of the best parts of my job. I love hearing about grannys who sew and about grannys whose grannys taught them to sew. I love eight year olds who make sock dresses for their babies. I love thirteen year olds who show off their messenger bags and are beaming at the recognition of their efforts. I love the 60 year old who is majorly obsessed with fabric and often just NEEDS all three yards for no particular project, just to fuel the obsession. I love it all. And with this story telling sometimes comes laughter and giddiness. Sometimes it brings pride and deep breaths. And sometimes it recalls a remembering of those who no longer sew, whatever the circumstance may be. It was through those conversations that a family, after their mother had since passed, bestowed a gaggle of fabric that they “just wanted to be put to good use.” This was some time ago that I received boxes of a fellow quilters things in honor of their seamstress who they loved so dearly. I put that fabric to good use and it never was a somber occasion. It always brought smiles and loveliness because a gift of fabric brings a desire to do something great with it. 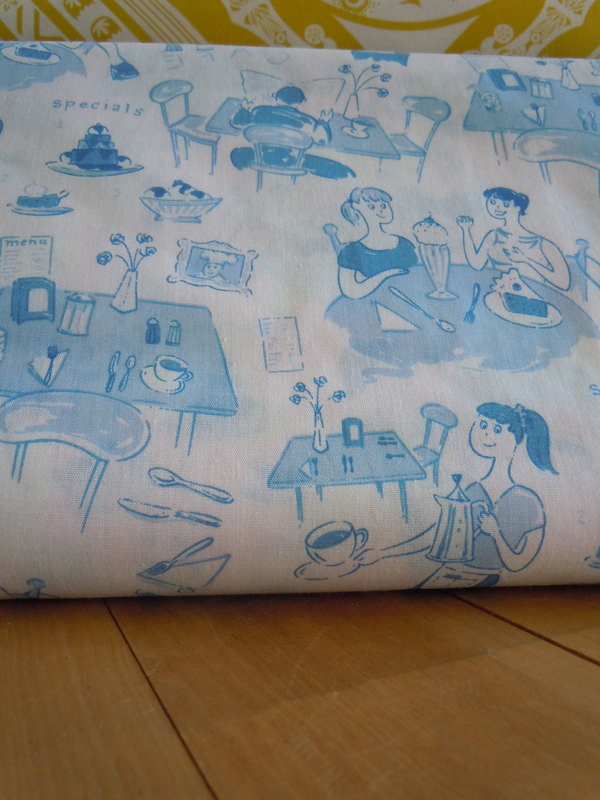 This fabric is ultra cute! It’s different from other fibers found at Crimson Tate :: Modern Quilter, but is supa fun, nonetheless. What do you have to do to get it this free fat quarter?! Come down to Crimson Tate :: Modern Quilter at 845 Massachusetts Avenue and check in on facebook and the Restaurant Toile fat quarter is YOURS! This game will continue until all the fat quarters are gone. Enjoy! And we’ll see you Downtown Indianapolis.